I Hate to be Silly, but it's also National Wave Your Fingers At Your Neighbor's Day! Ok, maybe you have or you haven't heard about National Wave Your Fingers At Your Neighbor Day. I know it's one of those zany things, but I must admit it does have a good point to it. We may get tired of hearing bad comments from our neighbor's because maybe we stepped on their lawn, or stepped in a flower bed or did something that upset them. I haven't done this to mine. Some I may have but they can't speak ~ that comes from knowing where my house sits. These people or "neighbor's" haven't been around for many, many years and that's as far as I'm going with that topic of them. I decided to make a card to represent the day so here it is. Sage Green Cardstock 8.5 x 11" cut in half at 5.5 mark. I then chose Mickey & Friends and Mickey Font for the front of the card. The hands are cut at 2.25 and the letters are cut at 1"
Remember to take the time to put aside your differences, and just say "hello." So open your fist, raise your right hand, and begin to shake because today is all about being friendly. 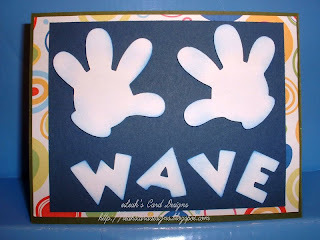 You can even be extra friendly by waving with some noise makers or by whistling to someone you like! Well, this card is on a long trip for now to it's new owner. It wasn't here long. Hope the new owners enjoy it. Thanks for stopping by ~ have a wonderful evening everyone! !